No screenshots? I remember seeing one screen in a magazine around 1997. It was of Mario and Luigi in a cloud level. I’ve never been able to find a scan online. It’s hard to find mention of it too, but there’s a couple people talking about it at http://www.youtube.com/all_comments?threaded=1&v=YyXUwgBBHI8 . I think it was in either EGM or Gamepro. Does anyone else remember this or have the screenshot? There’s a screenshot of Super Mario 64 2 in an issue of Nintendo Power. Though I have no idea if it’s a mock up or not, or if I even have that particular issue (I am misssing a few here and there). 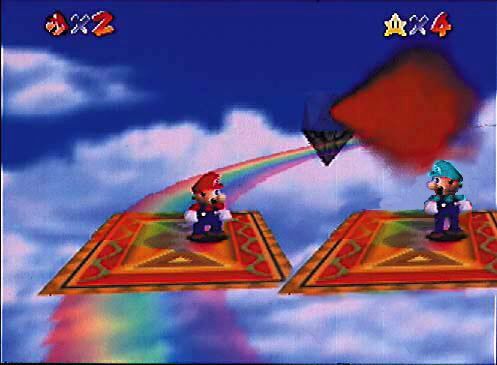 Has I recall it was Mario and Luigi on a course that bearred a striking resemblance to Rainbow Ride, witch is probably the same one Kevin saw. I’ll take a look and see what I can dig up. Though apparently I believe the screenshot is a Witch. So I’ll probably have to burn it at some point. Kevin…the magazine you’re looking for is Ultra Game Players, that is the only screenshot I’ve seen as far as Super Mario 64 2. Hey guys! 2 years ago i found an old magazine called “Tips and Tricks”, and i just found that it was announcing Super Mario 64 2, along with other unreleased games, like South Park for (original?) gameboy. There was also Paper Mario on the list and it had its prototype name! the issue is from september 1999. I’ll get a scan soon! i don’t know how, but i think i found a rom called Super Mario 64 2 Beta 5496! I will show some shots plus the magazine i mentioned in febuary. the rom is in a post at super Mario 128 central. Nintendo Talks Super Mario 64 2!